Book readings, fun activities, & goody bags! Bring questions - leave inspired. Both author events are free to the public though seating will be limited. 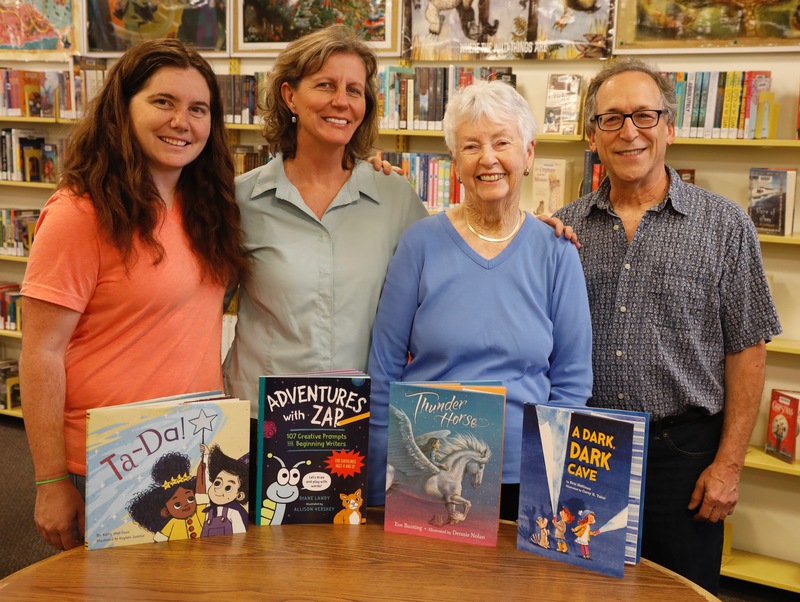 Friends of Santa Cruz Public Libraries will receive a 15% donation of all book sales. 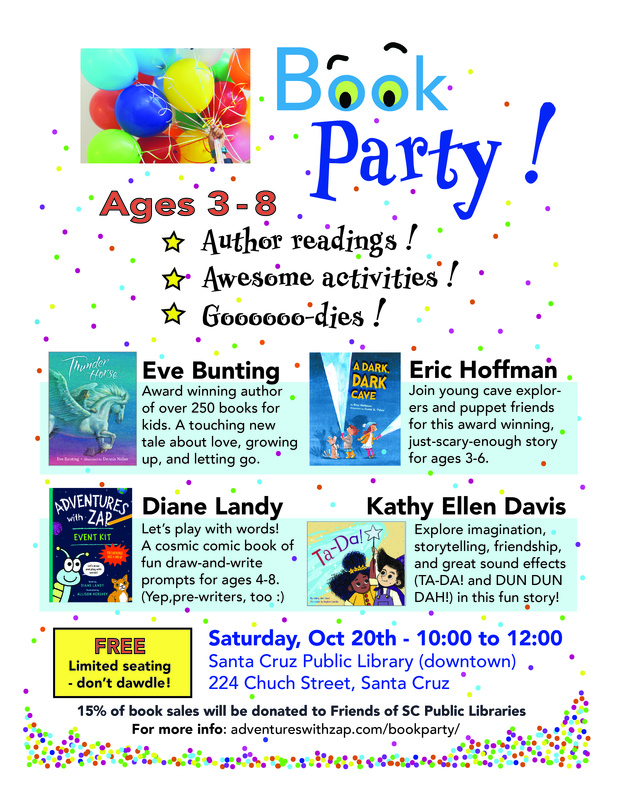 Four local authors will gather for a community celebration of new books for children ages 3-8, at the downtown Santa Cruz Public Library on Saturday, October 20th, from 10:00-12:00, beginning in the Upstairs Meeting Room. Festivities will start with author readings, followed by activity tables, book signings, and goodie bags. Cookies will be provided thanks to a donation from Pacific Cookie Company. To support the interests of local schools, authors will remain on site for a Q&A FORUM for EDUCATORS, in the Upstairs Meeting Room, from 12:15-1:00. 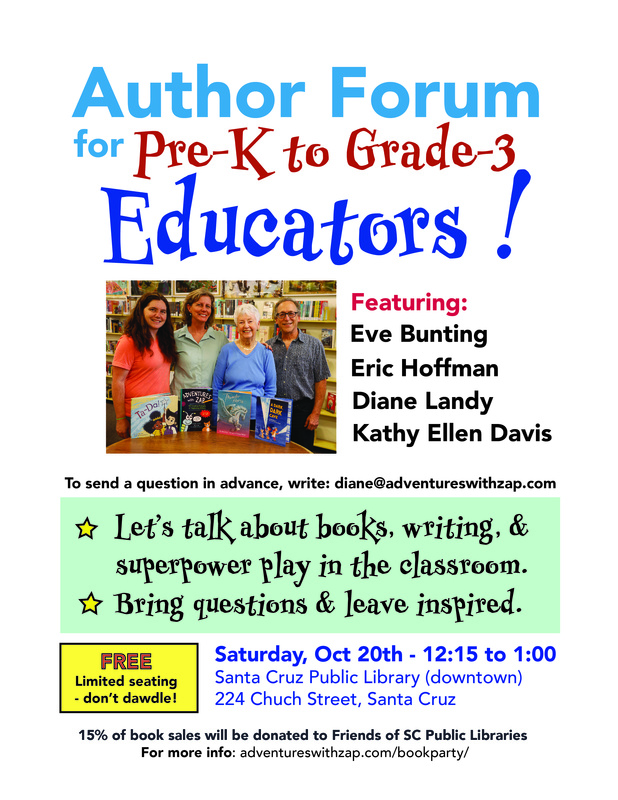 This panel is for teachers, librarians, and others working with pre-K to grade-3 students, who are interested in discussing books, writing, and superhero play in the classroom. To ask a question in advance, email: diane@adventureswithzap.com. Diane Landy is an advocate of playing with words, beginning with pre-writing narration through primary grade writing projects. Her book ADVENTURES WITH ZAP is the first character-driven book of playful prompts for creative writers, ages 4-8. A longtime classroom writing coach throughout Santa Cruz County, she launched a pilot test of her book at the library two years ago and used feedback from families to help develop the final edition. “Stories are the heart of writing. Mechanics are the brain. Writers need both. I believe young children should start with the heart. In time this will fuel the brain." Families will find a few Santa Cruz landmarks featured inside Zap's cosmic comic book, including Garfield Park Library and Steamer Lane, illustrated by another local, Allison Hershey. To find out more, visit: adventureswithzap.com, and ZapWrite boards on Pinterest. Eric Hoffman is the author of five picture books for children and two books for teachers. For the party he will read his latest picture book, DARK DARK CAVE. On a cold night, under a pale moon, a brother and sister explore a dark, dark cave. What will they find? Join them, and their puppet friends, for this award winning, just-scary-enough story for 3-6 year olds. For the panel, Eric will introduce an updated edition of a book he created for early education teachers, MAGIC CAPES, AMAZING POWERS: TRANSFORMING SUPERHERO PLAY IN THE CLASSROOM. “Creating stories through play is one of the main tools young children use as they try to understand how the world works. Most of my writing ideas are inspired by the language and play I observed in my thirty years as a preschool teacher.” Eric taught in the Cabrillo College Early Childhood Education program for thirty years, and designs toys and playgrounds. You can see his work at erichoffmanbooksandtoys.com. Kathy Ellen (yes, she goes by both names) Davis is a mama, a writer, an artist, a dancer, and a bookseller at Hicklebees, an independent bookstore in Santa Clara. Her picture book TA-DA! 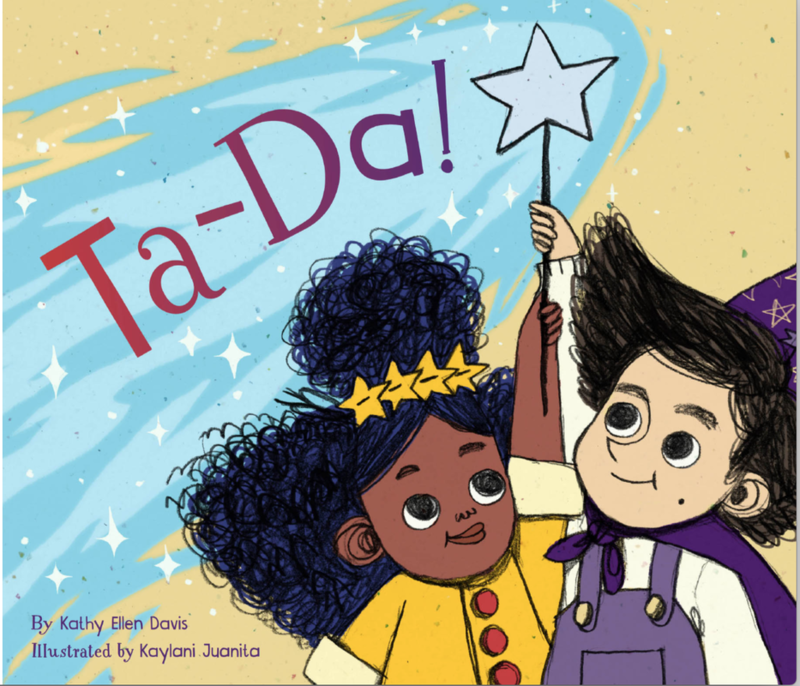 explores storytelling, imagination, and friendship with a fun cast of characters and two great sound effects, TA-DA! and DUN DUN DUH! Utilizing the central theme of conflict and resolution, her book is designed to gets kids excited about creating stories of their own. “I have always loved picture books and was lucky to have a Mom who never told me I was too old for them; that’s why I write them today! No one is ever too old to enjoy a read aloud with stunning art.” For more info visit: kathyellendavis.com. She is also on Twitter and Instagram. Santa Cruz has a strong reading population that supports our libraries and independent bookstores. This party celebrates and encourages this love of reading and sharing books with children.